Sterile single-use containers. Pop Top vial. 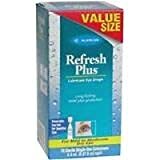 Allergan Refresh Plus Lubricant Eye Drops provides immediate, long lasting relief plus protection from dryness and irritation. Refresh Plus dose more than just soothe and relieve your eyes. Allergan Refresh Plus Lubricant Eye Drops also protects against further irritation with its unique long-lasting lubricant, CMC.